By the early 1990s, "inflation targeting" had become the state of the art thinking in central bank circles, replacing the previous failed experiment in Monetarism. After the crisis, there have been calls for a new target for central bank policy - Nominal Gross Domestic Product level targeting ("NGDPLT"). Amongst the two standard options, I think inflation targeting is more credible, for reasons to be discussed herein. We have two variables to target: inflation, or nominal GDP. We can target the rate of change (e.g., the annual inflation rate), or a fixed level that grows over time. The rate of change of the price index - (inflation targeting). The level of the price index (not discussed here). The rate of change of nominal GDP (not discusses here). The level of nominal GDP (NGDPLT). In all of these approaches, the promise of the government is much weaker than the promise behind a currency peg. The government only promises to adjust monetary and fiscal policy so that the target variable will act in a way consistent with the policy target (the rate of change remains near a target, or the level attempts to track a target level). The government does not promise, however, that the target will be hit exactly. This makes the promise plausible. For example, the U.S. government can do very little about the world traded price of oil, and so it has very little control over near-term realised CPI inflation. For the purposes of my argument here, the distinction between nominal GDP and CPI is not that important. What matters for my discussion here is how the two regimes handle errors. In inflation targeting, the central bank only worries whether the rate of inflation 1-2 years in the future remains within its target range. It has to justify previous misses to its political masters, but nothing is done about them. In NGDP level targeting, previous misses affect the return to the target. The second case is less obvious, so I will explain using charts with recent data. The Canadian experience with inflation targeting is often pointed to as the most obvious success of the policy. Canada announced a policy of keeping the annual rate of inflation between 1% and 3% in 1991, and the policy stance has been periodically renewed. (In the chart above, the shaded area starts in 1992.) Realised inflation has stayed mainly within the band, other than small jumps outside of the band, typically as a result of changing energy prices. It is beyond the scope of this article to say whether inflation targeting is inherently good or bad. I will assert that it politically popular; the only common complaints about inflation revolve around prices at the gasoline pump. However, the policy is credible, and that makes it hard to dislodge it for another framework for central bank policy. The credibility comes from the flexibility of the targeting framework. Errors tolerated. Firstly, the promise does allow for CPI inflation to leave the target range. This is unlike a currency or gold peg, where the price of the target asset is supposed to remain within a small trading band. This is realistic, as central banks can do little to deflect price shocks (notably oil price spikes). Room to manoeuvre. The average rate of inflation can deviate from the centre of the target band. This allows for more policy flexibility than mathematical treatments in the DSGE literature imply. Remain in "secular stagnation", and have "steady state" nominal GDP grow at a rate of 4%, and inflation of about 1.5%. They could loosen fiscal policy, raising the steady state nominal GDP growth rate to 5-6%, with inflation of about 2.5%. Both policy options would be compatible with the inflation targeting framework used by the Bank of Canada. Incidentally, this policy flexibility means that the belief that fiscal policy is ineffectual (because it will be offset by an inflation-targeting central bank) is incorrect. The models used to derive that result do not take into account uncertainty about policy effectiveness, and the target flexibility. Moreover, the assumption that money is neutral is dubious. No suicidal reset after large disturbances. Gold pegs typically ran into trouble after wars. During wartime. gold pegs were typically suspended, and the price level rose. Afterwards, policymakers crushed the working classes with deflationary policies to force wages back to their pre-war levels. A promise that a similar policy would be attempted in the future is not credible, as the working classes now have the right to vote. In an inflation target, there is no such promise; if the inflation target is breached (in either direction) for a period of time, nothing is done rectify the policy miss. This is very distinct from NGDP level targeting, as discussed below. I do not want to dwell here on the issue of whether targeting nominal GDP or a price index is better; what matters for credibility is the level target component of the policy. Yes, it would be nice to stabilise nominal GDP, but such a policy offers little guidance to entities within the economy. Most prices are administered, which is not a feature of the models used to justify nominal GDP targeting. Firms have some control of the rate of change of prices and wages, for which an inflation target provides useful guidance, but firms have no control over the volume of sales. The theoretical justification for path level targeting is the belief that policy action will need to be stronger after a shock, in order to return the target variable to its target path. This allegedly would eliminate "secular stagnation" even in the presence of the dreaded zero bound on interest rates. As someone in the post-Keynesian camp, I think neither side of that debate makes any sense. If we look at real world data, the problem with Nominal GDP level targeting is fairly apparent. The chart below shows how the level target would have evolved if a 5% NGDPLT had been put into place in 2000. The top panel shows the level of nominal GDP, and a target level, which starts out at the actual level of GDP in 2000, and then grows at 5% per year. Until the Great Recession hit, nominal GDP tracked it closely, but then a considerable gap opened up. The bottom panel shows the deviation from target, as a percentage of GDP. The gap has widened to about 15% of GDP, and it is increasing because the steady state growth rate in this cycle is below 5%. Proponents of NGDPLT targeting argue that if the United States had switched over to NGDPLT before the crisis, the United States would not have suffered from such a growth shortfall. As the tracking error grew, they would have been more desperate to hit target. Expectations would have stabilised around a higher path of inflation and nominal GDP growth. I am unconvinced by this argument; investors and policymakers believed for most of the post-crisis period that policy was "unsustainably loose", and inflation and growth would take off any minute. Policymakers were throwing everything at the wall, but nothing stuck. I doubt that the outcome would have been any different within a NGDPLT regime. But even if the regime shift raised growth rates, it seems unlikely that politicians - and voters - would have accepted an inflation surge that allowed nominal GDP growth to hit 8% or higher. But any growth rate less than that would imply an extremely long time to erase the tracking error, particularly if the economy fell into recession once again. And going the other way, imagine that there is some episode that approximates the economic effect of a war, with sustained high inflation and nominal GDP growth for a period of time. How are policymakers supposed to work off a situation where actual nominal GDP is 15% above target? The country would be forced to duplicate what happened during the return to pre-war gold parities. The probability that would be acceptable to voters is nearly nil. In the end, the level target would be revised closer to where actual GDP is, and the system would be reset. In other words, you end up with a system that is similar to targeting of the growth rate of nominal GDP, but it is harder to explain, and the parameters of the regime will be changed at arbitrary times. Control systems engineers have decades of experience with systems that approximate this behaviour. A central bank reaction function is a direct analogy of the control laws built into control systems. The need to override the nominal GDP level target if the tracking error gets too large makes a NGDPLT policy regime less credible when compared to inflation targets. In the third part of this series, I will discuss why I believe that promises to repay government borrowings are inherently credible. Minsky discusses the use of fiscal policy tools which act as "automatic stabilizers." I think his idea is to keep the economy on a GDP target using the combination of federal deficits (federal credit gas pedal), taxes (federal credit brake pedal), and monetary policy (endogenous credit gas/brake pedals). It appears your analysis may incorporate some unstated assumptions about the fiscal/monetary policy mix or the impossibility of Minsky's "automatic stabilizers?" I avoided making any assumptions. Monetarists would say that Canada's success in hitting its target is almost solely due to central bank action. I argue that it would be a mix of fiscal and monetary policy; I do not have a strong feeling about the relative importance. It is hard to relate fiscal policy to inflation; an inflation target is more easily understood. But it is clear that fiscal policy has to be consistent with the inflation target. If the Federal government ramped up spending at 10% per year, I doubt the BoC could stabilise inflation at 2% per year. As for automatic stabilisers, I am a strong believer in them. But note that they are automatic, and not discretionary. The U.S. had inflation during the 1960s credit crunch due to government spending and strong credit growth, and then stagflation in the 1970s which I think Minsky attributes to the large fiscal transfer mechanism at the time since high unemployment should tend to reduce inflation due to loss of aggregate purchasing power in the absence of fiscal transfers. Intuitively I think efforts to target GDP growth and stable debt to income ratios for private credit formation absolutely require fiscal policy tuning of tools that act as "automatic stabilizers." A central bank can always bankrupt some units by jacking up the short term interest rate to kill inflation but that increases the cost of fiscal deficits and may cause credit market disruption, so a tuned deficit/tax policy should help with control over the inflation boundary in a full resource economy. I am thinking of the macro-economic theory when I say that we don't seem to have a good grasp of QE, inflation and value of money. For example, we use QE to foster inflation but the effect seems to be directed at devaluing product sold to other currencies, effectively undercutting the prices that exist in the destination market. This is the effect of a weaker currency. Inflation directly strikes at saved money. It follows that inflation decreases the purchasing power of the savings prone part of the economy which is mostly the older population. The first economy to inflate therefore is reducing the purchasing power of one sector in the hope of promoting a second sector. But, and this is the lesson, the inflation effort is directed at lowering prices in the destination markets. If the destination market responds by instituting it's own inflation effort, then we have a combined result that two economies have struck against their saved money sector and there is a sector purchase slowdown in both economies. And we wonder why the world is entering a global slowdown!! If QE weakens the currency, yes you can think of it as "exporting deflation" (or at least deflationary pressures). Although that is the usual reaction amongst currency strategists, it is unclear how effective that has been. The U.S. dollar has strengthened a lot versus the Canadian dollar, and the U.S. has had QE, and Canada has not. Color me skeptical of inflation targeting in general, if we look at average inflation per decade since Congress created the modern Fed (1934), it looks like to me that these new Fed policies have had just about zero impact on long term inflation. In other words, once you eliminate the crazy outliers, deflation from the Great Depression) and inflation from WWII and the 70's oil shocks, we've consistently had a mild 3% average inflation regardless of what type of targeting regime has been in place. So how anyone can come to the conclusion that the Fed is the one controlling inflation is beyond me. The only thing the Fed has accomplished since in inception is to prevent depressions stemming from bank runs and financial crises that lead to large depressions and deflationary events. I agree that it is probably not just central bank policy; you need to incorporate fiscal policy settings as well. 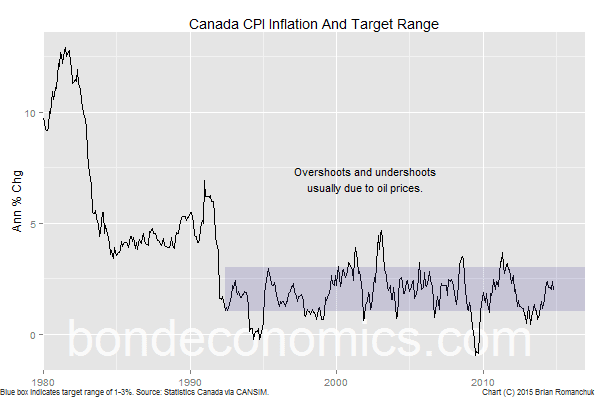 If you look at Canada, it did have persistent "relatively high" inflation until the inflation target was put in place (see chart above). There were a number of reforms that were put into place then, so it seems unclear whether it was just the inflation target. Volcker raised the short term interest rate sharply until some banks and nonbanks failed probably due to liquidity constraints. This would slow down credit formation, which should reduce purchasing power expansion, which should reduce inflation. I think banks were writing down adjusted capital for a period in the 1980s. Another theory of reduced inflation is that Saudi Arabia agreed to regulate the price of oil. I never said that CBs cant cause recessions. The impact of interest rate changes on inflation (monetary policy) cannot be separated from outstanding Govt securities. Therefore, there can be no rule such as "interest rate increases reduce inflation". I am not sure why you regard the level of government securities outstanding as relevant to the central bank capacity to set interest rates? In theory the Treasury and central bank can take measures to keep the two variables independent one from the other. This is the concept of "central bank independence." I do not regard the level of Govt securities as relevant to setting interest rates. I said that the impact of interest rate changes is dependent in large part on the outstanding level of Govt securities for the reasons I described above. The tendency of interest rate increases to cause recessions (and thus slow inflation) is also largely dependent on the type and level of outstanding private sector debt. An interest rate increase will have a larger negative impact if the private sector has lots of adjustable rate debt for example. I was simply pointing out that monetary policy impacts are not clearly defined in the real world. You have merely stated that the impact of changes in interest rates depend on levels of government debt. I don't see a reason or theory. I suppose if the float of govt bonds is greater, and interest rates rise, then a price drop in government bonds causes bond owners to experience a greater loss of wealth proportional to the bond float. If inflation is caused by aggregate demand taking slack resources out of the economy then it seems clear to me that a central bank can sharply increase interest rates to curb inflation regardless of the level of savings held as Treasury securities. Thus central banks have some non-zero impact to curb deflation at the zero lower bound and some non-zero impact to curb inflation at the full resource bound. In the middle it is more difficult to sort out cause and effect between central bank activity and endogenous activity. 1) a 5% FFR increase will result in $1.5 trillion in additional spending per year with a 200% Govt securities to GDP ratio. 2) A 5% FFR increase will result in $375 billion in additional spending with a 50% Govt securities to GDP ratio. Clearly, $1.2 trillion in additional spending in example #1 will have a higher inflationary impact than example #2. Now I see your point about monetary policy increasing interest income on short term liabilities that must be rolled over. However by sharply increasing this interest income to nonbank savers the central government also increases the long term borrowing costs to nonbank debtors and temporarily reduces the net interest income to banks and other financial intermediaries. The transmission of monetary policy is not understood by anyone from what I have read in the literature ... it is a bunch of speculative models. But it should have some non-zero impact under ordinary market conditions, and more effective impact at boundary conditions of zero lower bound or full resource inflationary economy if the central bank acts aggressively to counter the trend driven by markets. There has been zero long term inflation trouble regardless of CB policy. Inflation has come from War and oil shocks since modern central bank systems. No reason to believe CB's have anything to do with this.